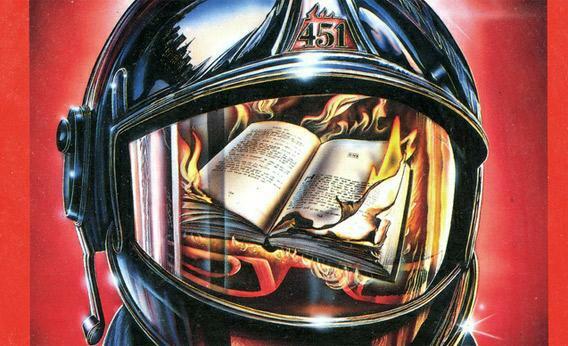 Ray Bradbury’s Fahrenheit 451 book cover from 1976. Publisher: Grafton. Illustrator: Steve Crisp. Author Ray Bradbury died on Tuesday. He named his most famous book, Fahrenheit 451, after “the temperature at which book-paper catches fire, and burns.” Does paper really burn at 451 degrees Fahrenheit? Not quite. Bradbury’s title refers to the auto-ignition point of paper—the temperature at which it will catch fire without being exposed to an external flame. In truth, there’s no authoritative value for this. Experimental protocols differ, and the auto-ignition temperature of any solid material is a function of its composition, volume, density, and shape, as well as its time of exposure to the high temperature. Older textbooks report a range of numbers for the auto-ignition point of paper, from the high 440s to the low 450s, but more recent experiments suggest it’s about 30 degrees hotter than that. By comparison, the auto-ignition temperature of gasoline is 536 degrees, and the temperature for charcoal is 660 degrees. It would take a few minutes for a sheet of paper to burst into flames upon being placed in a 480-degree oven, and much longer than that for a thick book. The dense material in the center of a book would shunt heat away from the outside edges, preventing them from reaching the auto-ignition temperature. This is also why it takes so long for a campfire to reduce a log to ashes. Bradbury asserted that “book-paper” burns at 451 degrees, and it’s true that different kinds of paper have different auto-ignition temperatures. Experiments have found, for example, that the auto-ignition temperature for newspaper is about four degrees lower than that of the filter paper used in chemistry laboratories. Some of this difference is attributable to composition, but it also has to do with density. Materials that are full of air heat up quickly and reach the ambient air temperature faster than solids. Glossy magazines are likely the most resistant to auto-ignition, although there isn’t a lot of experimental data on this. The paper is relatively dense and coated with a thin layer of plastic. Most plastics auto-ignite at higher temperatures than paper. Although paper ignites at around 480 degrees Fahrenheit, it gets far hotter once it’s burning. The temperature at the center of a paper fire is 1,500 degrees Fahrenheit, give or take a couple hundred. The tips of the flames themselves are usually between 600 and 800 degrees. Several Internet contrarians claim that Bradbury confused Celsius and Fahrenheit, putting his estimate off by 391 Fahrenheit degrees. They cite as evidence the Handbook of Physical Testing of Paper, which lists paper’s ignition temperature as 450 degrees Celsius. (Wikipedia cites the same source.) It’s not entirely clear how this number was arrived at, but it is an extreme outlier. The author appears to have used paper made with rayon or cotton, which could have a different auto-ignition temperature from pure wood pulp paper, but 450 degrees Celsius still sounds wrong. It’s also possible that the experimenters didn’t wait long enough or that they (and not Bradbury) switched Celsius and Fahrenheit. Explainer thanks Vytenis Babrauskas of DoctorFire.com, David G. Lilley of Oklahoma State University and Alexander Morgan of the University of Dayton Research Institute. Thanks also to reader Linda Whitson for asking the question.